While the doors of our adult courts in the UK are unlocked and anyone can just walk in and observe what’s going on they don’t effectively operate in an open and transparent manner. Our courts fail to pro-actively and openly publish information about what they are doing. I would like to see the court lists (details of upcoming hearings, trials etc. with the names of the defendants and details of charges) pro-actively published and kept up to date, along with the court registers (records of decisions, sentences etc.). I think we should all be easily able to track, monitor and scrutinise what goes on in our courts. I demonstrate that a Freedom of Information request can result in the release of a magistrates court list in a reasonably timely manner (my response took 6 days). I have included the text of this request and explained how I made it to assist others. I explain why I am not making my FOI response available in full online : it contains material that it is illegal to publish. I am publishing example court lists in full for selected upcoming sittings to be held at Cambridge Magistrates Courts, as well as further selected individual listed items in full too. I believe this is the first time this has been done. Surprisingly, and commendably, my request was reasonably promptly answered, in full, on the 15th of January. While I made the request in public via the freedom of information service WhatDoTheyKnow.com (directed to the Courts and the Tribunals Service). It has been hidden from public view there as the identity of victims of crimes people were being charged with, including a girl under 14 who was named in relation to an indecent assault charge, were released. If the Courts and the Tribunals Service had a responsibility to remove such information prior to releasing the information is an interesting question. This is information anyone can obtain either by making the same freedom of information request I did, or by turning up to the court and asking for a copy of the court list on the day of the hearing, or indeed by sitting in the court and hearing the charges being read out. If any other public body had released such highly sensitive information then the Information Commissioner would investigate, and it is possible that fines could be levied on the organisation and perhaps individual staff too. Reporting of information which could identify the victim of a sexual offence is contrary to The Sexual Offences (Amendment) Act 1992 as amended by Schedule 6, paragraph 31 of the Sexual Offences Act 2003, risking in the worst case a £5,000 fine. The law has an incredibly broad scope, an offence is committed by publishing any material which could lead to the identification of a victim. Since such cases are routinely heard in Cambridge’s courts, a copy of any week’s court lists will probably contain some – is pointing that fact out an offence? What about pointing out the court list for a specific period does? (I’ve redacted the date period from my request to avoid this possibility). What about saying if you sit in court for a morning you might well hear such information – is that an offence? Am I committing an offence of publishing material which could lead to the identification of a victim by including the link to my, now hidden, FOI request – perhaps some search engine or archive scraper took a copy and that will make the information obtainable in the future? There are parallels with defamation law, in that there are certainly innocuous sounding FOI requests I cannot mention or quote because doing so would point people to illegally defamatory material. A problem we have in this country generally is that many laws are so broadly written that almost everyone is committing some kind of offence at any time and should the state decide to arbitrarily take action against almost any individual they can; I think this is a highly undesirable state of affairs. Personally I am uncomfortable with identifying publicly any victims of crime identified in the court lists I have received and therefore have not done so. That covers the key information which is shown on the court list. I would like to see the courts service redact information it is illegal to publish from court lists and make them available online. This is a traffic court list. It includes someone facing charges of speeding on the road I live on, Milton Road, in Cambridge. The list states: “The speed recorded by means of a laser speed detection device was 36 miles per hour.”, this relates to an event on in July 2012 and is only reaching court in February 2013 – this appears a rather long time for a straightforward case. There are other cases of action being taken for speeding in 30 limits in Cambridge below 40 mph, there’s a listing relating to “High Street, Trumpington at a speed exceeding the legal limit of 30 miles per hour. The speed recorded by means of an automatic radar camera was 38 miles per hour”. There are also examples of people facing court action on charges of travelling at 80 MPH on the A14, both relating to average speed cameras near Bar Hill and as a result of the police operating “manned equipment”. I was surprised to see action taken for travelling at 80 MPH on a dual carriageway. This case may be of interest as there are currently proposals to change the law on using “insulting” words; it would be interesting to see how the law is currently having an impact in Cambridge. Events at Foxton Level Crossing are often reported in the press, and cause concern as this is a hazardous location where the fast train between London and Cambridge crosses a main road. Many cases of “fail to notify change of circumstances affecting your entitlement to social security benefit / other payment” involving local councils. On the 12th of February 2013 in Courtroom 2 at 11am there is a trial scheduled re: charges of sheet metal theft from Thorlabs Ltd in Ely. I want to live in a safer society, with lower levels of crime and fewer crime related injuries and deaths. When it comes to tackling criminality we need to be able to see where problems lie. We should be able to seek to address questions such as: “Is the work of the police being undermined by excessively lenient courts?”. I would like to be able to see if actions by councillors such as introducing new speed limits or setting up dispersal zones are effective and how the courts treat people charged with offences relating to breaching them, this would inform my lobbying and campaigning on such matters and perhaps even affect which way I vote. I would like to be able to find out when people are in court for offences committed in my local area, or in relation to subjects I am interested in. I would also like to be able to make my own judgements on if sentencing is fair, proportionate and effective with a view to making suggestions for improving the way we run our society, reducing re-offending and reducing crime. We need to have openness and transparency in our courts so we as individuals can find out how society as a whole expects us to act, and what the penalties are for breaching our laws. The published sentencing guidelines, judgements and those laws available on legislation.gov.uk provide a guide but more can be gleaned from observing our courts system work in practice. 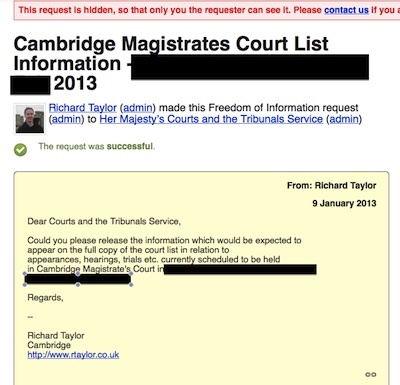 In April 2010 I made a Freedom of Information request for details of Upcoming Cases at Cambridge Magistrates Court which was largely refused. I’ve also asked information on how the Cambridge Magistrate’s Court register is held and for the procedure for obtaining a copy and that request was rejected. To view the kind of very limited information currently made public pro-actively online in relation to Crown Courts: See the Cambridge Crown Court list on the Justice.gov.uk website. Ideally it would be possible to remove material from WhatDoTheyKnow without taking down the entire request thread and correspondence. Currently individual messages and attachments cannot be hidden by the administration team (of which I am a volunteer member). WhatDoTheyKnow is open source, and anyone able to make the improvements is more than welcome to do so and submit them. There is a relevant issue on GitHub. I have personally had other material I would like to campaign on the back of hidden, including a response releasing sets of Cambridgeshire and Peterborough Probation Trust’s Board Papers. I’ve also commented on an accidentally released document which has been removed from WhatDoTheyKnow. Cambridge Court Usher Defies Lord Chief Justice on Transparancy – September 2012 – Includes continued lobbying via the Community Safety Partnership. Cambridge Community Safety Partnership December 2011 – I used the public speaking slot to urge greater transparency in the courts. Cambridge Magistrates – 17 November 2011 – Article following observation of the court where I note I was told there wasn’t a full copy of the court list available. Cambridgeshire Police and Crime Commissioner – Courts – October 2012 – My views on what our Police and Crime Commissioner ought do in relation to the courts. Cambridge Magistrates’ Court – My report on observing Cambridge Magistrate’s Court in April 2008. New Cambridge Magistrates’ CourtI visited Cambridge’s new Magistrates’ Court buildings on Thursday the 23rd of October 2008. This entry was tagged Magistrate's Court, Openness, Transparancy on January 22, 2013 by Richard Taylor. great stuff – you are not alone in this as you probably know – see link above. The court lists contain a defendant’s full name, full address, date of birth, and sometimes car registration or other personal information, even if they are found not guilty. Is this the sort of thing that should routinely be published online? There is a significant difference between having to be physically present at the court to learn this, and allowing anyone (friends, enemies, potential employers, identity thieves), anywhere, at any time, to immediately access this information. I think rather more editing/censoring is needed before these lists are regularly published. In any case, it seems to me that the sort of transparency you seek, such as determining if new policies are effective, or reviewing if sentencing is fair, is not really informed by the publishing of court lists which (seem to) contain no judgment or sentencing information. It’s important to identify people precisely, with names, dates of birth (or ages) and addresses to avoid defaming people who might otherwise be mistaken for the individual in question. The court lists do give a little more information than the press typically publish when they do cover a court listing, such as a house number or vehicle registration. I think we need to have justice seen to be done in public, and that includes publishing the identities of people who are due to appear in court along with what they are charged with. No one should assume because someone is due to appear before a court they are guilty, or think any less of them. I agree there’s a difference between being present in court and information which is published. A very large amount of material presented in court (as with the court lists) is subject to reporting restrictions and therefore illegal to publish. There are two FOI requests linked above for court registers, which will include “judgements” (decisions taken by magistrates – I don’t think reasons are routinely recorded but may be given in court) and sentencing information. The information in the court lists enables people to go to the court in person and observe cases of interest. Regular publication could for example allow those using the River Cam to observe how the Conservators enforce their by-laws via the court, allow cycling campaigners to see how the courts deal with offences committed by, or where the victims are, cyclists. The list alone doesn’t provide transparency needed, but it helps. I think it is inevitable with more information becoming available online, not least through the press, that it will become easier to find our about someone’s criminality in the past. I think our society’s views on rehabilitation need to change, in order to tackle crime and reduce the number of criminals we need to accept people can reform and allow reformed criminals to lead full and productive lives. I have been asked why the court lists name victims. On [Date] at Cambridge in the County of Cambridgeshire assaulted [Name] by beating [him/her]. Contrary to section 39 of the Criminal Justice Act 1988. Contrary to section 39 of the Criminal Justice Act 1988. Names are given in such and similar cases; also details are given of locations of burglaries / thefts mentioned in charges. Fascinating post and thank you for elaborating here, and on Twitter. A key issue, then, is the potential online publication of ‘full lists’ rather than the noticeboard list: who currently has access to them and how is dissemination of sensitive details prevented; if these were to be officially released online, in a publicly accessible format, how should they be redacted? I don’t think even the “notice board” lists from magistrates courts are available online yet; really that’s only designed for people turning up at court to find out where and when their case is to be heard. All that’s given is the defendant(s) name, the prosecuting/informing authority (usually a part of the police or a council) and the court, time, and a reference number. That list isn’t really any good for finding out about a particular cases of interest unless you already know the defendant’s name. Currently I think many people get the full court lists via arrangements which make them subject to contracts or protocols (information on such a protocol). Those obtaining a list via a FOI response are not subject to such contracts; however they are of course subject to the laws on reporting. My previous FOI requests for listing details of particular cases have been rejected (there are examples linked in the above article) and another example was my request for “Court Appearance Details – Handlers of Cambridge’s Stolen Bikes”. This is contrary to the direction I think was being given by Jack Straw as Justice Minister who I think was saying via the above linked protocol that information ought be supplied in relation to more specific requests, perhaps in preference to the release in bulk of large amounts of material which would probably not be of much interest. (eg. huge lists of those who’re facing action relating to not paying a council tax bill on time). I think as a general principle public sector information ought be created with a view to disclosure so any sensitive and personal information which is exempt from disclosure to the public ought be kept separate from the start. We need to change the way records are kept, rather than creating work redacting material on release. I would like court lists released following whatever redaction is required such that they can legally be published. There’s still a question of what the law ought to be. The only material I personally would want redacted from the court lists I received would be the victim’s names. Even then I think there shouldn’t be a blanket removal of such names; certainly children’s names ought be removed, and perhaps those who are victims of domestic violence – but if I was assaulted in public by a stranger I’d be happy with my name being released in the court list. There were no child defendants in the lists I obtained, but if there had been any (they appear in adult court when charged alongside adults) their names ought to have been released. As for the question of how long material ought be kept, either online in raw form, or in articles, my view is it should not be removed. Any idea how Chris Huhne gets to have his days in court with a complete media blackout? Due to the existence of an order under the Contempt of Court Act 1981, the media is currently banned from reporting on the trial. I suppose one could make a FOI request for a copy of that order; then consideration could be given as to if this, or the previous comment, breach it. the court may, where it appears to be necessary for avoiding a substantial risk of prejudice to the administration of justice in those proceedings, or in any other proceedings pending or imminent, order that the publication of any report of the proceedings, or any part of the proceedings, be postponed for such period as the court thinks necessary for that purpose. Presumably there must be an actual order which tells us at least what that delay period is. Difficult to see how I could comply with an order I don’t actually know about. I do think that whatever the circumstances of the case, the fact that ‘normal’ people’s court cases can be well publicised but a senior politician can have a potentially damaging court case held in complete secret doesn’t do anything to enhance the view that everyone is equal in the eyes of the law. Today’s Sunday Times reports Home Affairs Select Committee Chairman Keith Vaz as promising an inquiry into the police dealing with criminals other than by taking them to court. One of the concerns raised in the accompanying articles is that sanctions handed down by the police, for example in relation to cautions, restorative justice disposals, or other out of court options are dealt with “behind closed doors”. If our courts are not effectively operating in an open, transparent and public manner then the difference between the out of court and in-court due process is not as stark as it ought to be, which perhaps explains how the out of court option has crept up to being so popular and perhaps why those police officers involved have not seen the increase in out of court penalties as wrong. I think there are also problems with the fact our court process is often, as shown by some of the cases in the lists mentioned in the above article, very slow. If our courts were more functional – if they were speedier and more public – then I don’t think we would see the police trying to take on a greater role in sanctioning criminals out of court. I suspect as so often what we’re seeing to a degree is the police responding and trying to pick up the pieces where other elements of the public sector are failing. It would be good to see some senior justices’ clerks and others responsible for the administration of the magistrates courts contributing to the inquiry. We’re also seeing magistrates courts become more remote, following closures and courts handling cases from wider areas – this too might make opting for an out of court sanction appear more attractive and more proportionate to a police officer working in location without a local court. redact information or send the wrong attachment). Work and Pensions, Superintendent [surname]. by, for example, magistrates hearing the cases. Act and of the definition of sensitive personal data. would want to publish all of the information released. where a judge or magistrate will have imposed a reporting restriction. I think there are a number of elements of this response which are not accurate, or contrary to my experience. When I have attended court the full lists have been made available to those asking for them. Where they’ve not been forthcoming the reason given has been has been they need all the copies they’ve got in order to run the court. When full lists are provided to the media in court they are not made available under any protocol/license/contract – provision of the list in court is quite different to obtaining lists via the routes/services which do involve entering contracts and agreeing to comply with guidelines etc. I understand WhatDoTheyKnow will be seeking a replacement response so that the request can be republished – in line with their usual practice in such cases. This is excellent; the Community Safety Partnership appears to be on-side in calling for Cambridge’s Court Lists to be made public, and the Partnership includes Cambridge’s local councils, the police, the probation service, local voluntary bodies and even the magistrates! It is notable that the partnership has written to the magistrates, and not the courts service. 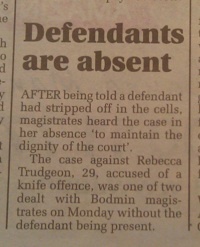 Perhaps they are hoping for the magistrates locally to take direct action? Hi Richard, as long promised, I’ve blogged on this at http://informationrightsandwrongs.com/2013/02/07/courts-contempt-and-data-protection/ although I need to return to the subject, as this is only a preliminary post. Will Perrin, a member of the Government’s Crime and Justice Transparency Sector Panel, has tweeted to he’s written to them to bring this case to their attention. Interestingly while the names of most youths are replaced by the word “Youth” some names of those listed to appear in youth court are given. It isn’t easily possible to directly link to court lists; which appears to have stopped them appearing in search engines. under the CPR (rather than the FOIA). of Information Act regime. Please accept my apologies. process does not apply in this instance. The court is considering your request and you will receive a response in due course. In my view this is not a clear response. If my request is considered a valid FOI request then the Freedom of Information Act requires a public body to respond. If they wish to refuse my request they need to give grounds citing one of the exemptions in the Freedom of Information Act. If they are refusing my FOI request then I have not been told what exemptions in the FOI act they are relying upon to withhold the information I have requested. I can’t see myself getting any further with the courts so think I ought appeal to the information commissioner. I have now appealed to the commissioner as I have noted on the request thread. Part five section 8 of the Criminal Procedure Rules appears highly relevant. (iv) the judge, magistrate or magistrates, or justices’ legal adviser by whom a decision at a hearing in public was made. The Criminal Procedure Rules are part of the law; legislation.gov.uk link to Part 5 Section 8. There’s nothing about timeliness of a response to a request, nor details of any potential charges for accessing the information. Labour MP for Exeter Ben Bradshaw has written a tweet revealing that he was under the impression that offences (at least driving offences) were “a matter of public record”. @rtayloruk court lists are published, no? I explained they really aren’t; pointing to this article and my attempt to get the court register for just one day in Cambridge Magistrate’s Court released. I have submitted a complaint to the Information Commissioner’s Office. The latest position taken by Cambridge Magistrates is that a request for a particular day’s court list does not adequately describe the information being sought. disclosure to you under section 32 (1) (c) of the Act. They also cite the personal information exemption. My view is they have too broadly interpreted S32; it is intended I believe to apply to documents relating to specific cases. As for the personal information, this is largely information which ought be accessible within the court, and it would be reasonable for others to publish. I accept some other personal information may be present and would expect that to be redacted from any response, it’s presence ought not prevent a response being provided at at all. It will be interesting to see if the Information Commissioner’s Office accept the Ministry of Justice’s new position. The relevant guidance from the Information Commissioner does not address Court Lists, which is telling in isself, it talks about documents being presented to a court during the course of a case. The lists would only be covered by the exemption, if they had been created “only by virtue of” “created by a court or member of the administrative staff for the purposes of court proceedings”. This is not the only purpose of the court list; the court list exists to inform the public (including via the press) about upcoming cases; eg. as well as the court clerk having a copy one would expect one to be available at a court’s reception desk, and perhaps ushers to have copies to provide to the public (such as members of the press) in court. I picked the date to request the information for on the basis it was just over twenty working days away from the date of my request. I had no expectation of my own personal information being on the court list and can think of no reason why it would be. The internal review response dated 26 July 2013 contains what I consider to be a number of inaccurate, or at the very least unclear statements. My request has been considered not to be covered by the criminal procedure rules; as they have been judged to relate to specific, identified, cases only, and not as a court list or register, all case in a particular time period. The information being sought is not placed on public display. 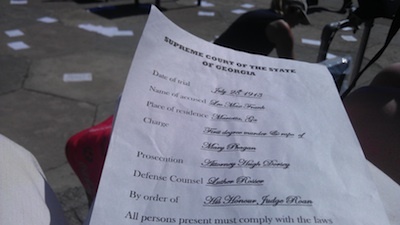 A version of the court list, typically containing only names of defendants, the court room, expected time of the hearing and the prosecuting authority are posted, but this is not the full list, which includes additional information including the charges. My request specifically states I am seeking the “full list”. I have no knowledge of my own personal information being included on the 25 February 2013 court list. I think this statement is highly unlikely to be true. I can think of no reason for my personal information to be present on the court list. I can only imagine that perhaps a note relating to this request appeared on the list. I hope that the Information Commissioner can determine, when I appeal again, if this exemption was correctly applied. I have submitted a further complaint to the ICO; asking them to consider the same points as I raised prior to the internal review and including my comments on the internal review response. It was a historical play; presumably that’s what used to happen in Georgia in 1913? I hope the practice returns to Cambridge soon. 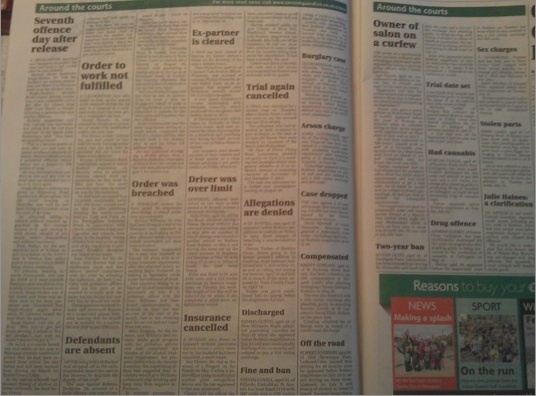 A court report in the Cornish Guardian shows what we are missing in Cambridge in terms of detailed reporting of routine court business; something which could be made easier for people to do if there was easy access to court lists. I have this morning received a paper decision notice from the Information Commissioner by post. It is reference FS50506566 and will be available soon via http://search.ico.org.uk/ico/search/decisionnotice [Update: it's available here. The decision relates to my requests for court lists and registers for specific days at Cambridge Magistrates court, the decision states the courts service "was entitled to withhold the requested information" . The courts service reveal their internal jargon for the two types of court lists; they call the lists posted on notice boards in the courts "public lists" and the full version with more detailed information "standard lists". The courts service claimed to the information commissioner my request for the "full list" was ambiguous; there is no ruling on this point. The key element of the decision relates to if Section 32(1)(c)(ii) of the Freedom of Information Act applies to court lists and registers. That comes down to if the information is only held by virtue of being contained in any document created for the purposes of proceedings a particular cause or matter. The Information Commissioner has accepted the Courts Service's position that court registers are "simply for the purposes of proceedings" and standard (ie. full) court lists are produced "so that the magistrates' have a summary of the court cases listed before them". My view this is wrong. The full court lists ought be available to the public in court, they are key for the public, particularly members of the public wanting to observe or report on particular cases, to find out where they are being heard. The standard lists are printed from the LIBRA computer system by HMCTs' staff, and are provided to Magistrates' [sic] hearing those cases. Unlike the public lists … the standard lists are not placed on public display, or , released to the general public. In my experience the full court lists are available on request in court and they are routinely handed out to those requesting them. The essence of the commissioner’s decision is that court lists and registers exist only “for the purposes of proceedings”, which makes them exempt from disclosure under the Freedom of Information Act. The commissioner does not agree with my argument that the court lists have a function of informing the public what is happening in court. I have 28 days to consider if to appeal to the First Tier Tribunal (Information Rights). It’s worth stressing that my request has been considered, and rejected, under the Criminal Procedure Rules and the courts service are not relying on the “information accessible by other means” exemption in section 21 of the Freedom of Information Act. What I have done already in demonstrating how hard it is to access court lists or registers may assist those pushing within the establishment for their proactive publication. My view is that proactive publication is far preferable to making requests via FoI. If court lists and registers were accessible via FoI this might provide an incentive for courts to get on with proactive publication so as to reduce the administrative burden of dealing with requests. Given the use of the words “particular cause or matter” in s32, you’d think it wouldn’t apply to a list of multiple cases. I think that’s definitely worth appealing. In practice costs orders in the Information Tribunal are extremely rare. If your case has no hope of success it’ll just get struck out early on. The deadline to appeal this to the first tier tribunal has passed; and I have not appealed it. My prime reason for not appealing was not wanting to expose myself to the potential of a costs award against me. Had it been possible to get a hearing first on the question of if bringing appeal was reasonable, thus limiting the potential costs, I would have appealed. I think it is absolutely critical to our society that our courts do not continue to operate effectively in secret. I hope what I have demonstrated that in practice court lists are falling between the Criminal Procedure Rules and the Freedom of Information Act and are not currently accessible via either. I think winning an appeal a the tribunal might have helped speed up pro-active publication of court lists; and a return to open and accessible courts. Proactive publication of the court lists would bring much needed modernisation to the way the courts share what they are doing with wider society. If the Criminal Justice and Courts Bill is to be amended to provide access to upcoming cases, and decisions, relating to cases dealt with by individual magistrates in secret then why not provide the same information for other cases too. I think my next step should be to write to my MP asking him to pass my correspondence on to the relevant ministers at the Ministry of Justice. I would explain my experience seeking court lists and registers and ask the Ministers if they are happy that court lists and registers are not consistently easily accessible. I could ask that if they disagree with their officials’ interpretation of the Criminal Procedural Rules then they act to ensure a more reasonable interpretation is used in the future. Sadly I have lost all faith in our legal system. Both police and courts. The police arrest people for no reason, and the courts allow unlawful actions to continue. A magistrates court is simply a method to extract money from the people. Sadly, this is the only reason it is there. Councils rent rooms in courts and conduct unlawful hearings… Oh the whole system is corrupt. I mentioned the difficulty I have had obtaining court lists when making a submission to the House of Commons Committee on the Criminal Justice and Courts Bill in March 2014. The Home Office responded with a copy of it which can be read on the whatdotheyknow.com website. It covers the headings of court lists, register of court decisions, charges and confidentiality of certain material. I have been asked to email you on behalf of Susan Acland-Hood, Chief Executive of HM Courts & Tribunals Service (HMCTS), in response to your tweet about why magistrates’ court lists and registers are not available online. Even though the provision of court lists and results is not currently available online, the courts must comply with existing Criminal Procedure Rules which set out what information can be supplied to the media and public in criminal cases. This includes information as to the identity of the parties in the case, offence details, date of hearing and outcome. The Rules also cover the procedure for publishing information on lists in the public area of the courtroom including the identity of the defendant, type of hearing, identity of the court, the offence or offences alleged and whether any reporting restrictions apply. HMCTS is about to embark on a major reform programme to bring the justice system up to date for the modern world and take advantage of advances in technology to provide a more efficient and accessible service for users of the courts and tribunals. The Common Platform (a new cross-agency IT programme) is already being developed to provide a single case management IT system for use throughout crown and magistrates’ courts. It will provide access to case material and information to many agencies within the criminal justice system as well as the defence, victims and witnesses. Many current paper and court based processes will be moved online, saving time and increasing efficiency for all court users. These reforms will also provide new opportunities for open justice and transparency. HMCTS is currently considering how technology can be harnessed to support greater and more uniform access to case information for the media and wider public, including the potential wider publication of listing online. It’s excellent that there is consideration of getting court lists online (you’d expect that given the minister’s announced there’s a plan for publication). It does appear that while some staff at the top of courts service are aware of the provisions of the Criminal Procedure Rules requiring the release of court listing information those actually dealing with requests, such as my requests for, for example, a week’s magistrate’s court listings, and the listing information for a specific case did not result in the information sought being released. The letter notes the requirements to publish material “in the public area of the courtroom”. I have experienced and reported on a breach of the requirement to post certain information on notices in the vicinity of the courtroom (Para 9, of Part 5 of the Criminal Procedure Rules).